I was wondering you could help me understandthe value of a couple of items. 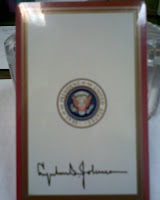 One is LBJ playing cards. 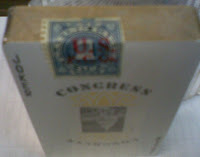 They still are sealed and never opened and have a special seal over the top. 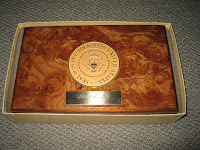 The other is DDE Colmbine presidential seal playing cads. They are open but in great condition. Theresa has a 1908 Election Commemorative Plate. 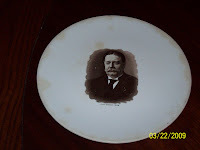 Picture of William Howard Taft (black and white) on off white colored plate. Caption below picture reads, “Our Choice 1908.” Produced by Carrollton China. Franklin Delano Roosevelt coin. Produced by A.I. Berkowitz, Charleston, Illinois. 1.5 inch diameter. "Good Luck Democratic Victory Souvenir Coin November 3, 1936" on reverse. Submitted by Frances from Wisconsin. I've had a folder in my files from my grandfather, Edward Emil Sager, who was City Clerk in Appleton, Wisconsin in about the 1940's. 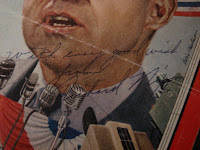 My grandfather carried on all sorts of correspondence with politicians. 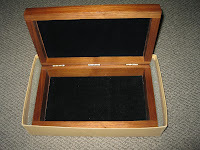 The folder includes two letters from Herbert Hoover. 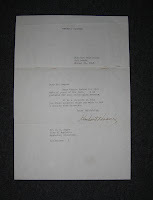 The first, typed one has Herbert Hoover letterhead, and is from Stanford University August 1945 in response to a letter my grandfather wrote, and sending speeches he requested (I have the speeches he sent). The hand-written letter is dated August 10, 1949 and is in response to a birthday greeting from my grandfather. 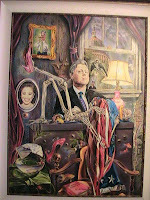 I have an oil painting by Dan Schilling, called what is is here is a picture of it. i would like to sell it. If you would like to make an offer on this item or offer information on its value to John, please hit the comment button or email us at appraisals@loriferber.com. 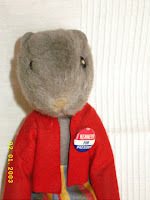 Submitted by Joan: A "democrat rat", he has a metal badge pinned to his red felt jacket 'kennedy for presedent" Measures about 10 inches high. He came out of storage about 20 years ago and left US about 20 years before that. 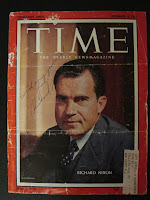 Submitted by Jeff: Time Magazine covers November 5, 1956 and December 9, 1957 hand signed by Richard Nixon, "With every good wish, from, Richard Nixon" and a full magazine December 9, 1957 which includes the article, "Cuba, The First Year of Rebellion". 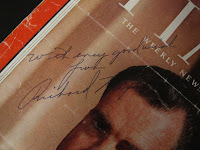 The December 9, 1957 signed cover was sent to my father and has the mailing label to: CAPT CARROLL W BENNETT, STAR RT 1, COLLIERS MILLS RD, NEW EGYPT N.J., the U.S. Air Force Pilot stationed at McGuire AFB, who flew Nixon on his South America tour and personally acquired his autographs. 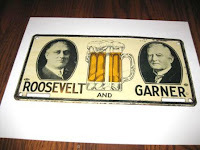 Submitted to Paul: I have an FDR/Garner license plate attachment that I am interested in selling. Overall, in pretty nice shape. If you are familiar wiht the value of this item or would like to make an offer to the seller, please click on the comments button or email your response to appraisals@loriferber.com. Submitted by Eidnas: Limited edition plate from the Candlelight Dinner during the 1981 Official Inauguration of Ronald Reagan. Believes production was limited to to 1, 032 plates. Would like to know what the value of the plate is and would accept offers for it. Kathy & Roy have this 1888 General Ben Harrison Campaign Ribbon that they have not been able to find listed anywhere. Can you help? Thank you to everyone who particpated in the launch of http://www.appraisalbuddy.com/. 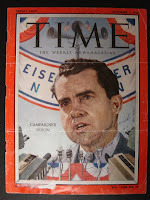 During our initial trial we've helped dozens of people appraise their political memorabilia and find new homes for their treasures. Based on this success we are going to be expanding the website over the months to come and we are happy to report that it will remain free to everyone. 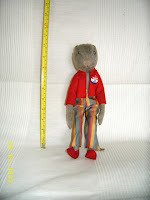 And yes, if there is an item you would like to make an offer on you can do that too! Share your knowledge of the item and its history.